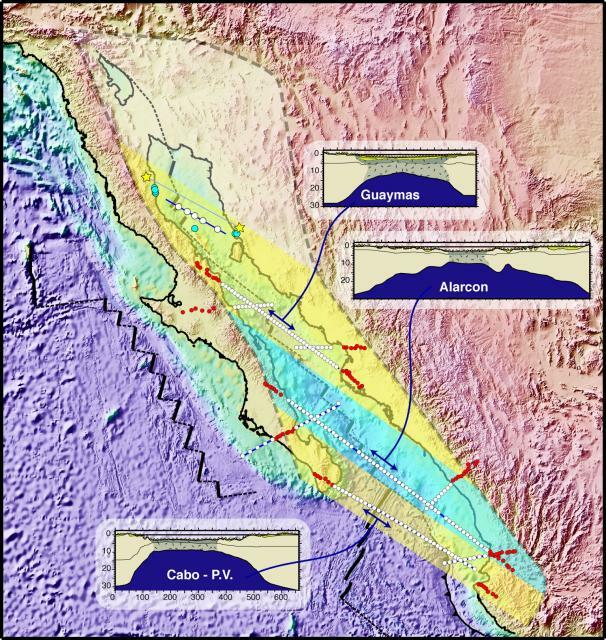 Map of the PESCADOR experiment layout and crustal profiles in the Gulf of California. Small white and red dots are ocean-bottom and land seismometer locations of the PESCADOR experiment; larger white and blue dots are instrument locations of the CORTES-P96 (Gonzalez-Fernandez et al., 2005) experiment; and yellow stars indicate the geologic constraints on northern gulf spreading (Oskin et al., 2001). Approximate boundary of the post 14-Ma Gulf Extensional Province (GEP) is indicated by the bold dashed line. Crustal profiles from the Guaymas (Lizarralde et al., 2007), Alarcon (Sutherland, 2006)*, and Cabo-PV (Brown, 2007*; Paramo et al., 2008*) segments are shown, with extended continental crust shaded tan and new igneous crust shaded grey and stippled. These results, along with the seismic and geologic results from the northern gulf, define distinct structural domains within the GEP, with narrow rifting indicated by yellow shading and wide rifting indicated by blue shading. Image from the MARGINS 2008 Decadal Review research nugget.